AI (Artificial Intelligence) is dynamically disrupting industries one by one. In recent years technologies have been transforming the educational sphere, with new edtech companies bringing innovations to the table. Chatbot abundance is justified: this qualitatively new UX is about convenience, swiftness, and maximum personalization. Speaking about personalization — the convergence of chatbots and tutoring can finally place the learning process on the right track. In the 1980s scientists came to the conclusion that one-on-one tutoring is much more effective than boring lectures in crowded classrooms. Effective and yet – costly and not scalable. AI enables the chance to tailor education for particular students, based on specific abilities and preferences. Chatbots provide the anticipated personalized approach, including control over content quality and quantity as well as constant feedback. The idea of integrating AI in Messenger – where people spend most of their time – was implemented in Nerdy Bot. Nerdy Bot – a combination of AI and Human Personal Assistant, designed by Nerdify to quickly tackle any college-related tasks and homework. It has beaten every single bot to become Product Hunt’s top Messenger bot of this year based on the number of upvotes. Being a study assistant and a converter bot, Nerdy Bot will answer any homework-related questions. The whole idea behind this is to give students a ‘friend’ who is always available to help them with studies. 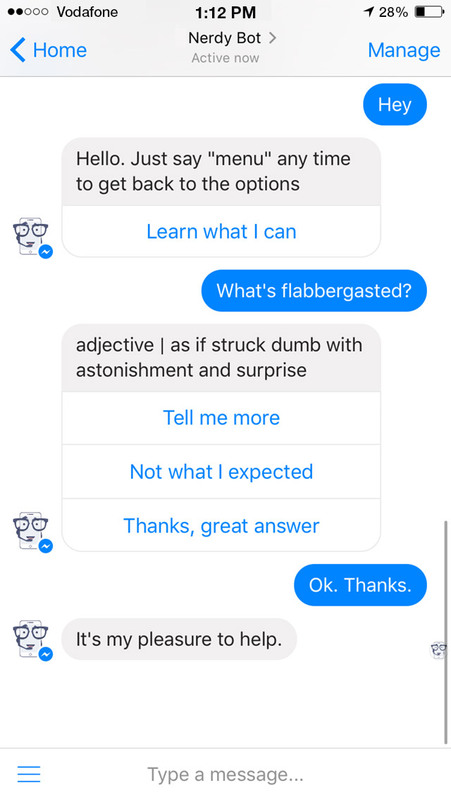 Used largely by students, Nerdy Bot is accessed via Facebook Messenger and provides answers to the user’s questions without having to use search engines. Nerdy Bot uses machine learning technology and NLP engines to address any academic task. The AI component of Nerdy Bot is excellent at looking up information about works of art, balancing chemical equations, getting definitions, checking historical events and dates, discovering any place in the world, getting familiar with famous people of current and past times, and being your online “buddy” whom you can tell anything, anytime. Communication with Nerdy Bot is always simple, smart, and natural – like you are talking to a real human. In the case of a complex assignment, which requires extensive research or calculations, a chatbot offers students an opportunity to find a qualified tutor to handle their tasks. All in all, Nerdy Bot is able to deal with a number of college subjects from history and literature to physics and mathematics. 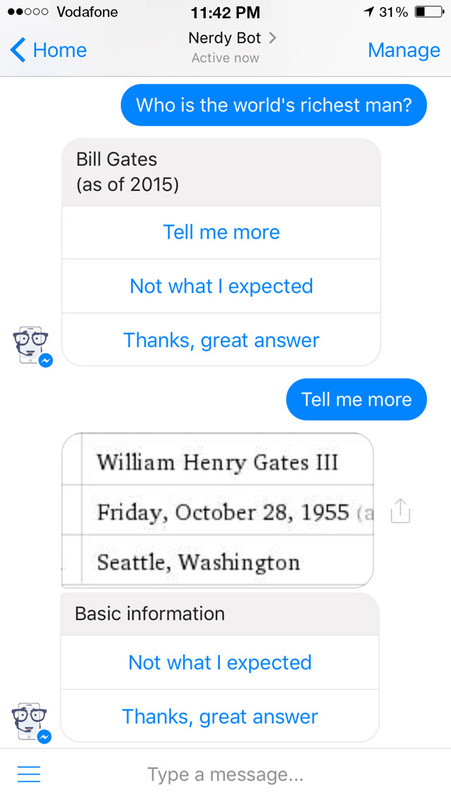 To get started, message a chatbot on Facebook by typing your question. When you ask a question, Nerdy Bot generates a brief answer for you. You can evaluate the accuracy of the response by saying “Not what I expected” or “Thanks, great answer”. 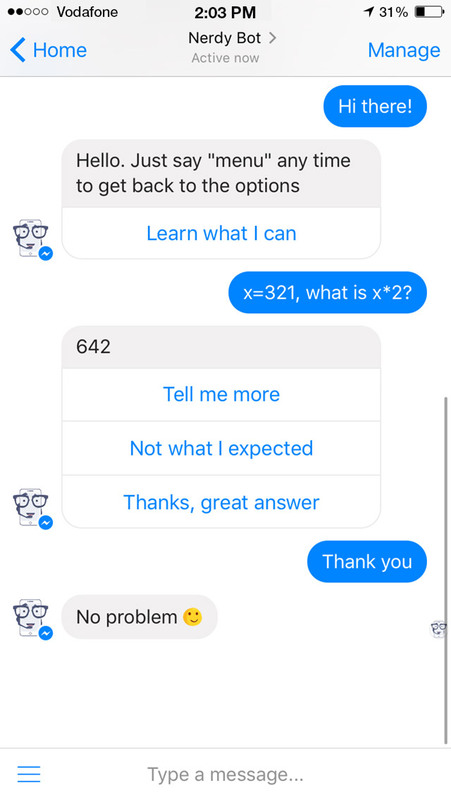 Using Facebook Messenger, just ask the Nerdy Bot account a question and it will instantly send back an answer, exactly like messaging friends on the platform. There is no sign-up for using this service and Nerdy does not need to access your contacts, which is nice in an age where most apps or services attempt to scrape every last bit of information from customers. Unlike other bots, communication with Nerdy Bot is seamless and natural. 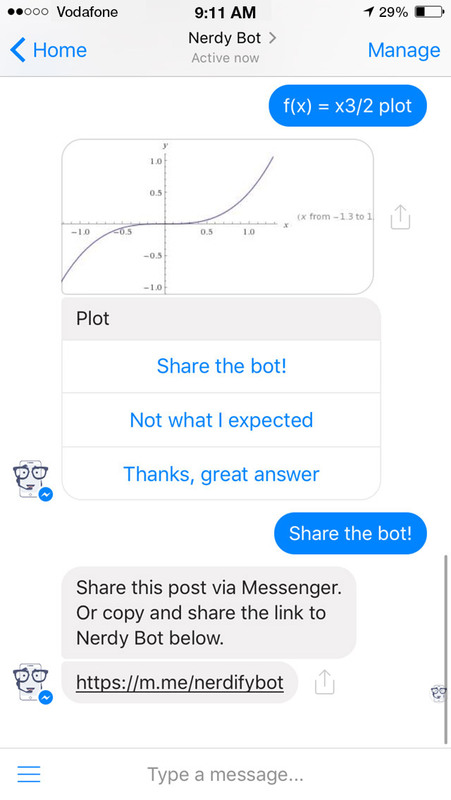 Nerdy Bot is a smart Facebook Messenger bot powered by AI, officially launched on May 20, 2017 by Nerdify. The company is based in San Francisco, California. Nerdy Bot offers college and university students personalized AI help on various academic-related tasks. Alex Pokatilo, founder at Nerdy Bot, is a firm believer in personalized learning and use of AI in education. He is also a co-founder at Nerdy Tutors and an active investor in EdTech, with 6+ years of experience in launching and scaling online businesses in global markets.